Figure 1. 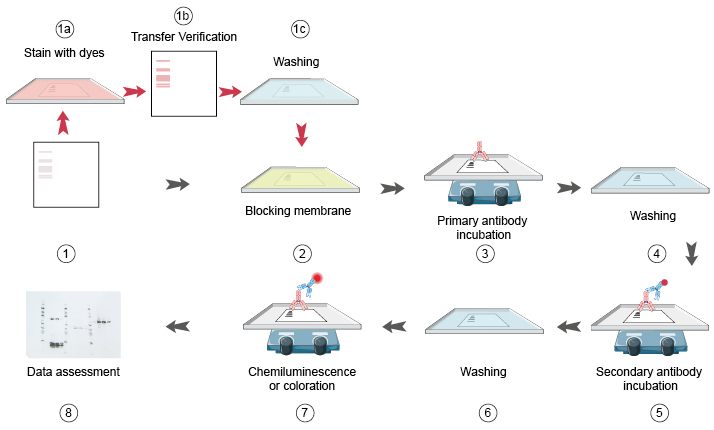 The antibody incubation process of western blot after protein transfer onto membrane. As non-specific binding of antibodies to the membrane is detrimental to the specificity and sensitivity of the assay, it is essential to "block" spaces not already occupied by proteins. Choice of blocking strategy will be guided by samples and the antibodies used. The most common permanent blocking agents include bovine serum albumin (BSA), non-fat milk, normal goat serum, casein and fish gelatin (Table 1.). As each antibody-antigen pair has unique characteristics, no single blocking agent is ideal for every Western blotting process. Determining the best blocking agent and optimal concentration are key steps for the success of immune detection. PBS or TBS are commonly used as buffers for blocking agents. Common blocking buffers including 5% non-fat dry milk or BSA in a TBS-tween solution. However, do not use dry milk solution when probing with phosphor-specific antibodies, as it can cause high background from its endogenous phosphoprotein, casein. It is important to soak the blotted membrane in freshly prepared blocking agent for 30 min to 2 h at room temperature with constant agitation. Alternatively, soaking the membrane for 1 h a 37°C or overnight at 4°C can help solve some persistent background issues. Decant the block solution and wash with TBS-tween for 5 minutes. Following the blocking step, the protein of interest can be detected using antibodies. This following process are very similar to ELISA. Many tips and cautions in ELISA are equally applied in western blot. Both monoclonal and polyclonal antibodies can be used for Western blotting analysis (Table 2). The most two important standard while choosing an antibody are: 1) weather it can recognize the denatured proteins; and 2) weather it can cause cross reaction. Polyclonal antibodies tend to be more sensitive, but are less specific than monoclonal antibodies. Monoclonal antibodies, on the other hand, tend to be more specific but less sensitive. Polyclonal antibodies are usually chosen for their relatively lower price and less time consuming to produce. • Primary antibodies should be raised in species as distinct as possible from the sample species: it is better to raise a primary antibody against a mouse protein in a rabbit, for example, rather than a rat. Table 2. Difference between poly and mono clonal antibodies. Dilute the primary antibody in a blocking buffer at the concentration recommended to the datasheet. Incubate overnight at 4 degrees Celsius with gentle shaking. A recommended option step is to also use a positive loading control antibody which allows the user to verify equal amounts of total protein were loaded into each well and aides in troubleshooting by removing any uncertainties with the western blot procedure. The next day, decant off the primary antibody solution and wash the membrane with large volumes of TBS-tween and vigorous agitation 5 times for 5 minutes each. These stringent washes are extremely important for removing non-specific background signals. A wide variety of secondary antibodies are commercially available. The choice of secondary antibodies depend firstly on the species in which the primary antibody was produced. For example, the primary antibody was of the IgG isotype and produced in goat, the secondary antibody must be an anti-goat IgG antibody produced in another species as it will bind to the Fc region of the primary antibody. Although there is no strict rule, secondary antibodies raised in certain host species may lead to high background levels. The procedures for incubation of the secondary antibody solution and the membrane are essentially similar to those described for the primary antibody. Dilute the secondary antibody in blocking buffer and incubate the membrane for 1h in room temperature at the concentration recommended on the data sheet. Decant secondary antibody and wash the membrane with large volume of TBS-Tween and vigorous agitation 5 times for 5 minutes each, and ready to the next detection phase. A variety of detection systems, based on chemiluminescence, chemifluorescence, fluorescence, chromogenic or radioisotopic detection are available. The coloration/visualization system are also very similar with ELISA. See Immunoassay and Chemiluminescence Immunoassay Guide for further understand the detection system. The most common, most sensitive and most inexpensive detection method is the electrochemiluminescence (ECL) system. This method utilize the HRP enzyme, which was conjugated to the secondary antibody to catalyze the ECL reaction and produce light. The light is then gathered by detection machine and print onto x-ray film and developed or digitized with the aid of specialized CCD camera sensitive enough for detection. There are two kinds of ECL reagents: reagent A and reagent B, we mixed these two ECL reagents in 1:1 ratio, and incubate the membrane into the reagent for 3-5 minutes without agitation. After incubation, decant the ECL mixture and use a wipe to wipe off excess solution from the corner of the membrane. Place the membrane in a clear plastic wrap such as a sheet protector to prevent drying. Both film and camera system allow to manually adjust the exposure time in order to ensure a picture perfect western blot. Relative band density can be quantified with commercially available software. Proper molecular weight can also be verified by comparing band size to the molecular weight ladder. Dissolve in 400 ml ddH2 and add to final volume of 500ml. 10% SDS (PH7.2) SDS: 10.0 g, dissolve in 80ml ddH2O, and add to final volume of 100ml. keep 68°C to help dissolve. (ammonium persulfate) AP: 1.0g, dissolve in ddH2O and add to volume of 10ml. Attention: AP can just keep in 2 weeks at 4°C, better use 0.2ml aliquots at -20°C for storage. Dissolve in 800ml ddH2O and add to volume of 1L. Dissolve in 900ml ddH2O and add to volume of 1000ml. Dissolve in 100ml TBST and well mixed. Could be store for 6 months at room temperature. Use filter paper to make filtration if precipitation. For the trouble shooting of common causes of unusual or unexpected bands, no bands, faint bands or weak signal, high background on the blot and more, please read our WB TROUBLESHOOTING TIPS.